COSMEDICO RUBINO: What is that? Cosmedico is a well known german manufacturer in the field of artificial tanning equipment (low and high pressure tubes, starters, ballasts, etc.). It’s one of the oldest tanning tube manufacturer in the world. Cosmedico has been shaping the tanning industry by regular innovations for almost 40 years. The strategy of this brand is to provide to tanning professionals and individuals the benefits of the sun where and when they wish. They are renowned for their high quality products (security, reliability, services) that are customizable to client needs. In the field of UV tubes, Cosmedico is notoriously known for its ranges COSMOLUX, COSMOFIT +, COSMOSUN, COLLAGEN PRO BEAUTY in the following powers: 15W, 25W, 36W, 100W, 120W, 160W, 180W, 225W. What distinguishes the technology COSMEDICO? The quality of the tubes allowing the users a quick and long lasting tan while respecting the standards in force. 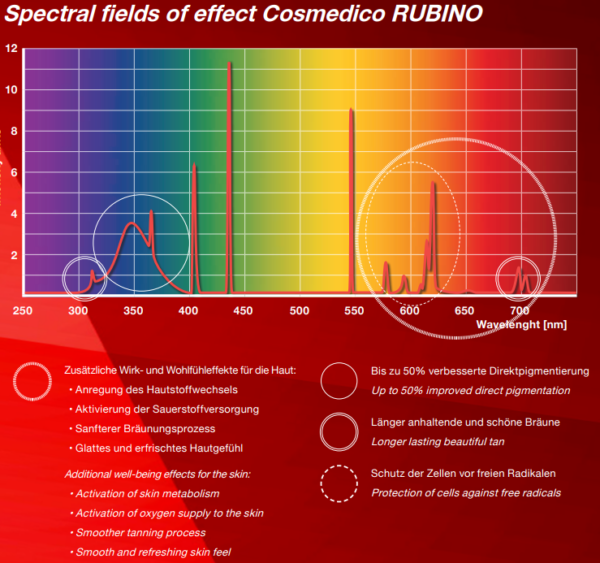 With Rubino, Cosmedico has built a tanning technology allowing a quicker (less sessions), deeper and more durable effect. This technology combines the effects of UV radiation and those of the red light for beauty therapy. But that’s not all! The combination of these 2 aspects maximizes the tanning effect. Like all Cosmedico products, the tubes (lamps) last longer than competing technologies. The power of the tubes (thus the effectiveness of the treatment) is reduced as the tubes age. With Cosmedico, this decrease is slow to keep the efficiency as long as possible. Direct improvement of skin pigmentation (tanning) up to 50% => More beautiful skin color-tan. More accurate tanning and according to a more graduate process => Fewer sessions and longer lasting results. Sensation of a smoother and softer skin. Protection against free radicals at the cellular level. Activation of the oxygen supply at the cellular level => Better skin hydration-oxygenation, more beautiful tan. Activation of the cellular metabolism thus of the cell repair => More beautiful and glowing skin. 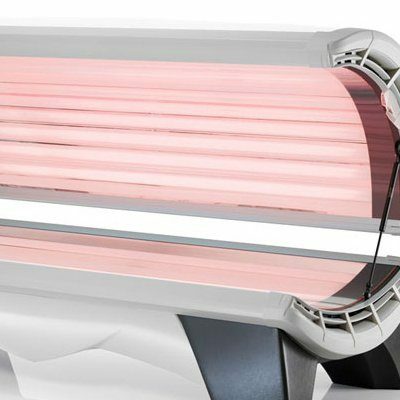 Tanning in the solarium that use the RUBINO technology is felt as a relaxing experience because of the emitted infrared. WHERE CAN YOU USE THE RUBINO TECHNOLOGY? The Rubino technology is available to general public primarily in tanning salons worldwide. It is also available through tanning lamps and tanning beds sold directly to individuals (over 18 years old).